Mohave County, in northwest Arizona, has excellent water resources which boasts 1000 miles of fresh water shoreline, all part of Lake Mead, Lake Mohave, Lake Havasau, and the Colorado River. Lake Mead - The largest reservoir in the United States, formed by water impounded by the Hoover Dam, it extends 112 miles behind the dam. Mohave County straddles a major part of Lake Mead. Lake Mohave - Lake Mohave is a 68 mile stretch of the Colorado River that has 237 miles of fantastic refreshing shoreline with blue water, cliffs, sandy beaches and sheer rock for exploring and sunning. Lake Havasau - Lake Havasus is a fun-in-the-sun 45-mile-long playground with hundreds of miles of stunning shoreline, sandy beaches, secluded coves and cool sparkling waters. A water lover's paradise and a desert lover's dream, 300 days of sunny skies per year with warm, dry air make this a magnet for sun-bathers and watercraft toys such as kayaking, boaters, jet skiers, water skiers,fishing, and houseboating, all year long! There are 16 launch ramps in the Lake Havasu City area that provides convenient access to the lake, and eight fueling docks ensure that you can explore all Lake Havasu has to offer without fear of running out of gas. 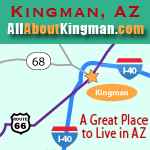 Katherine Landing - Access to Lake Mohave, located off Arizona State Highway 68 at the north edge of Bullhead City. Temple Bar - Access to Lake Mead, located off US Highway 93, about 20 miles south of Hoover Dam. Willow Beach - Access to Lake Mohave and the Colorado River, located off US Highway 93, about 10 miles south of Hoover Dam.